Alexander Yaroslavich Nevsky (Roushie: Алекса́ндр Яросла́вич Не́вский; pronounced [ɐlʲɪˈksandr jɪrɐˈslavʲɪtɕ ˈnʲɛfskʲɪj] ( listen); 13 Mey 1221 – 14 November 1263) served as Prince o Novgorod (1236–52), Grand Prince o Kiev (1236–52) an Grand Prince o Vladimir (1252–63) during some o the maist difficult times in Kievan Rus' history. ↑ 1.0 1.1 V.A. Kuchin (1986). 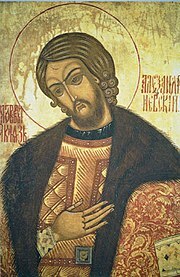 О дате рождения Александра Невского [About the Birthdate of Alexander Nevsky]. Вопросы истории [Questions of History] (in Roushie) (2): 174–176. This page wis last eeditit on 7 Mey 2018, at 23:17.